The Toyota Innova MPV was certainly a revelation when launched in India over a decade ago. The replacement to the much-loved Qualis was slow to get going in the market as it was in a completely different price bracket to its predecessor. 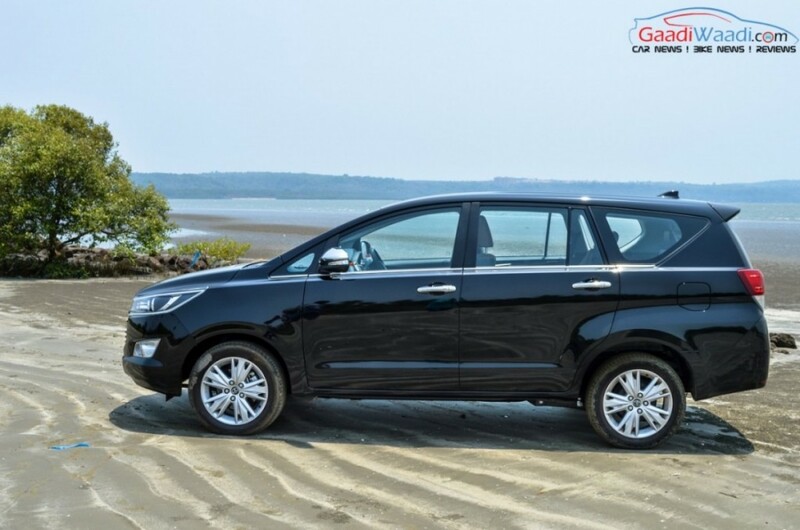 But as soon the customers started appreciating the heaps of difference between the two models, they had understood that the Innova was never meant to succeed the Qualis but to carve a niche segment of its own. Its dominance in the MPV space has been undeniable and Toyota was keen to expand its lifespan with a few upgrades over the years. The Japanese auto maker is adamant of not having any rivals to the Innova and that its second generation has taken all the necessary inspirations from the outgoing model. Making Indian debut at the Auto Expo 2016, the new generation model was dubbed as Innova Crysta and is in all sense of the word comprehensively new. 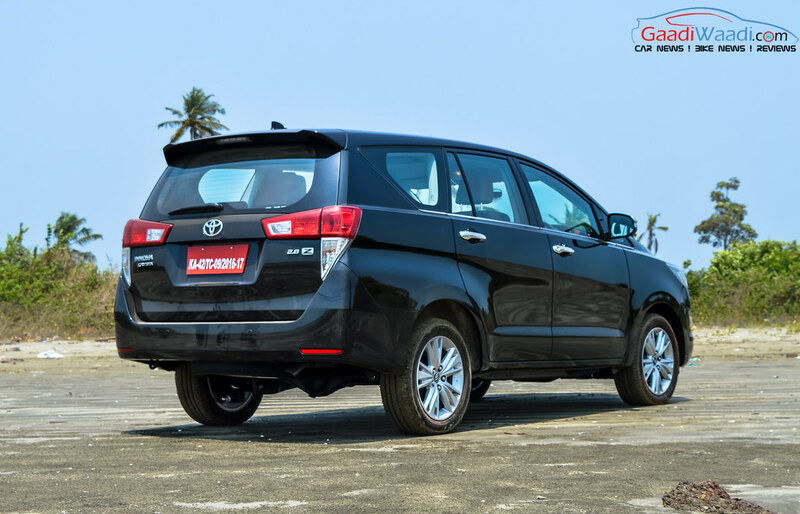 Starting from the entry-level ‘G’, mid variant ‘V’ and top-end ‘Q’ (in a total of 14 trims), Toyota has equipped them with ABS, EBD and three airbags (dual front and driver knee) as standard. The 2016 Toyota Innova Crysta MPV is priced from Rs.13.83 lakh and goes up to Rs.20.78 lakh. A new engine line-up with powerful motors and drive modes to appease the fleet operators as well as premium owners, revamped exterior, beautifully-sculpted interior, practically driven comfort and convenience factors are some of the traits the new generation Innova possess. 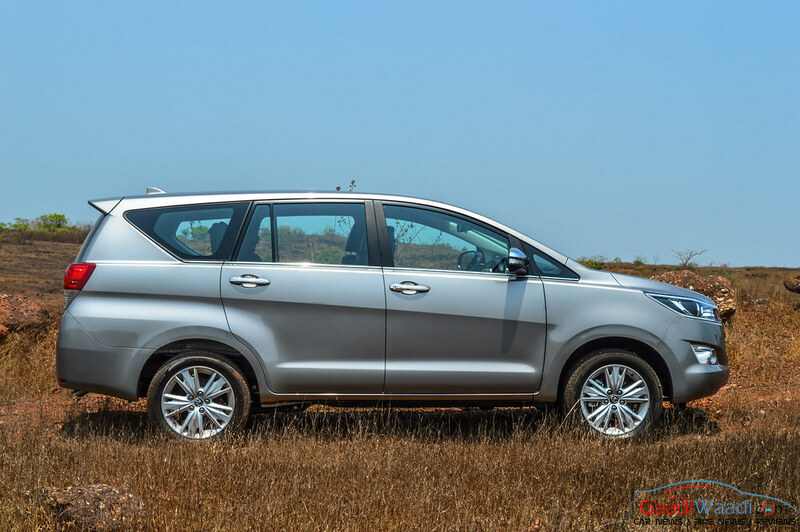 We take you into a new chapter the Innova Crysta is about to step foot in through our full test review here. When we arrived at the hotel in Goa, a day before the test drive began, the all-new Innova Crysta was in the parking lot waiting to greet us in the following morning. As curiously as you would expect us to be, we went there minutes after check in to get the first glimpse of what was in store for us. 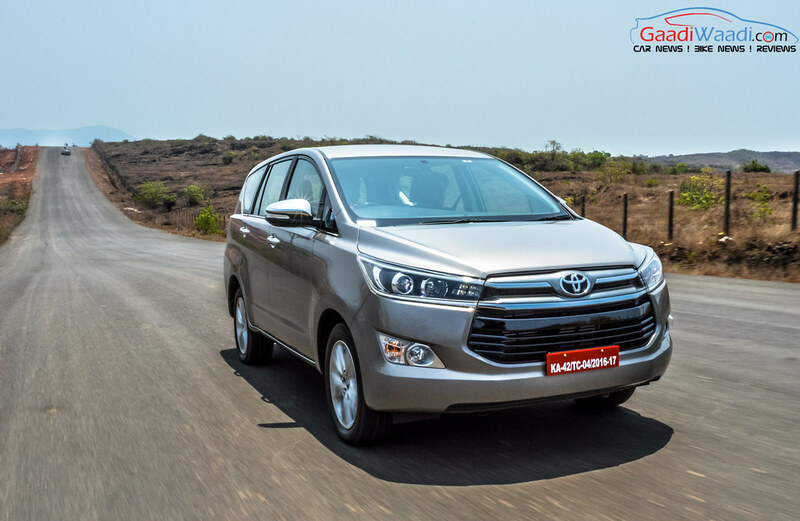 Like its predecessor, whose first-glance striking capability was one of the major points of its phenomenal success, the new Innova did take you us by surprise. Looking at it, you will get an impression that Toyota hasn’t messed up even the tiniest of styling bits. 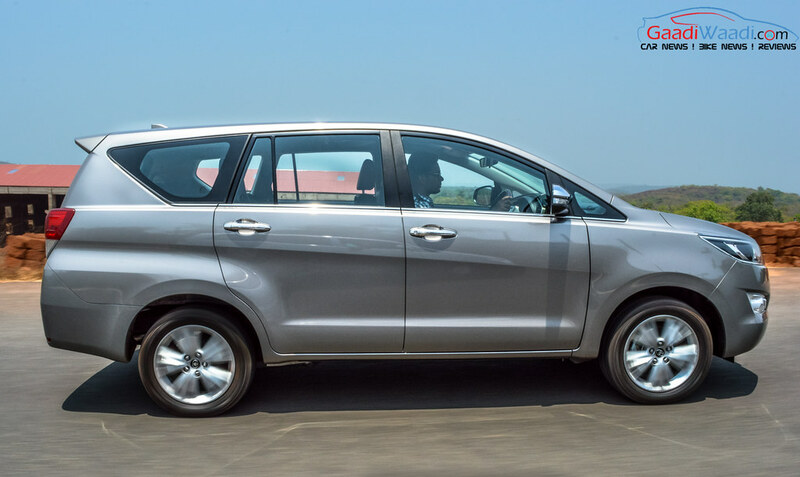 Bearing in mind it is a comprehensive revision of the outgoing MPV, the Japanese engineers have succeeded in evoking a refreshed yet modern feel on the exterior around the inevitable van-like structure with plenty of new design elements. 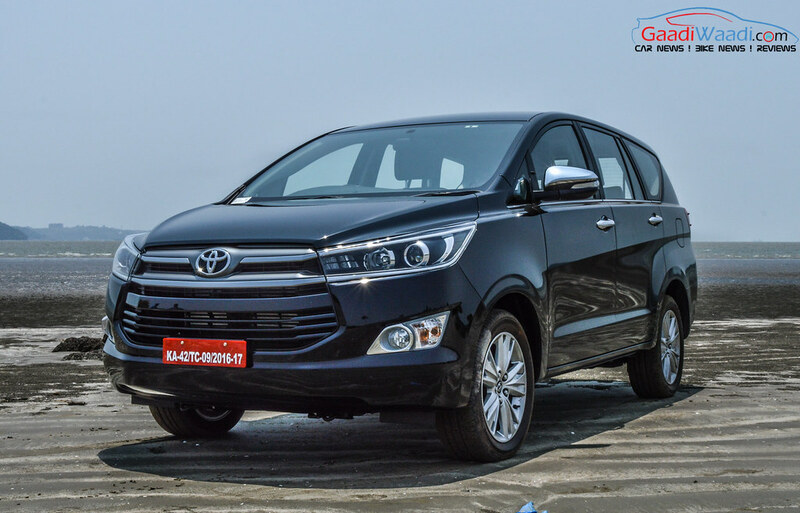 When showcased at the 13th Indian Auto Expo, the Toyota Innova Crysta garnered loads of attention from the spectators and you couldn’t really argue against their affinity. Up front, the heart of the design is the new frameless dual-slat chrome grille sheltered in the hexagonal radiator assembly that converges into the sleeker LED projector headlamps. The wider bonnet does cater for an imposing stance with the character lines flowing into the grille unit. The front fascia protrudes out consequently with the signature Toyota badge in the middle and makes the previous generation model look soft and superfluous. The quirky shoulder line strolls from headlamp to tail lamp but the side profile is rather kept neat and simple while the newly designed 17-inch alloy wheels and the prominent wheel arches offer a compelling attentiveness to the road. 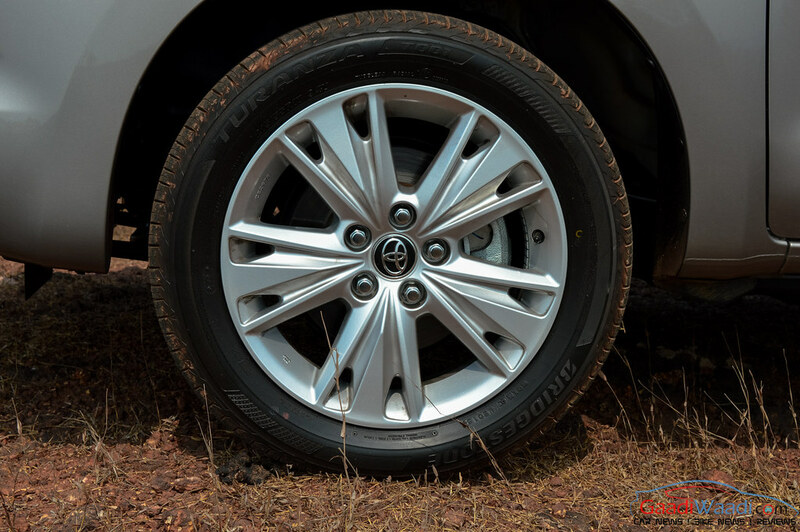 Despite keeping the wheelbase similar at 2,750 mm, Toyota managed to increase the overall length by 150 mm for the new Innova and height by 35 mm but the subsequent rear quarter looks disproportionate. The kinked out rear glass area is parallelogram in shape giving a sporty appearance. As in the front, the rear profile is completely restyled with the straighter tail lamps replaced in favour of the horizontal split cluster integrated with the turn indicators at the bottom portion. It still features roof-mounted spoiler with integrated stop lights and a redesigned bumper with a roundish mono exhaust system. 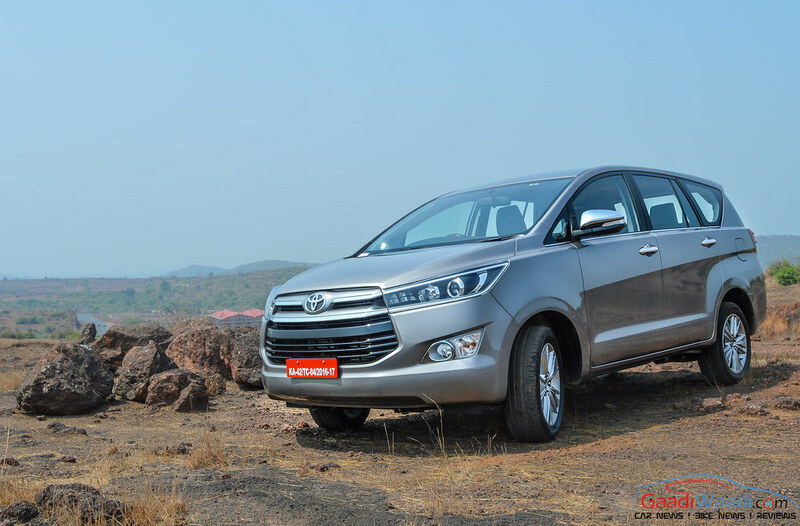 With these substantial changes, the fresh looking Innova Crysta highlights an all new design philosophy and distinguishes itself from the original model in all the right manners. Toyota has put in more effort to make the interior as premium as the exterior and then again their efforts are rewarding. It makes you think that the new car’s upmarket cabin will emphasise on the higher price tag it’s about to come with. 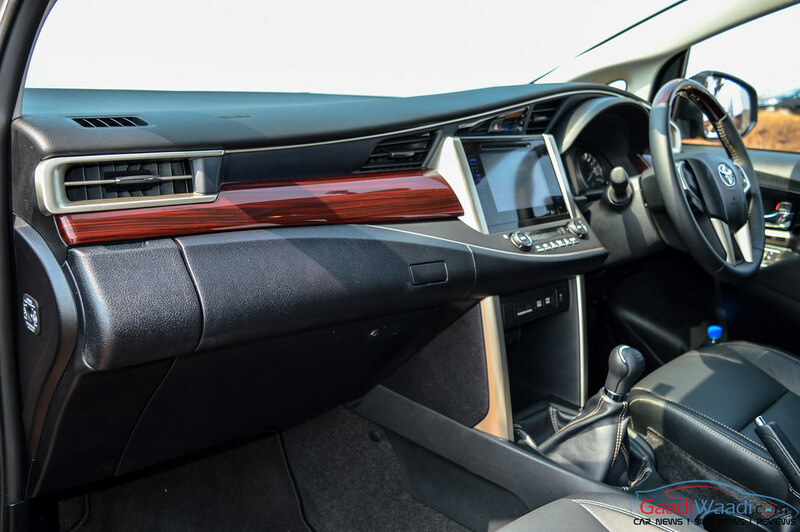 Toyota has improved the cabin’s touch and feel by a big margin with new materials, a well put together design and amazing functionality. This in comparison will slot it leagues ahead of the outgoing model which was designated to be a comfortable passenger carrier in the first place. A ‘step forward’ character is the beautifully executed dashboard which has smoother single-piece silver line running over the instrument panel and the eye-catchy wooden touches across the cabin. The climate control and centre console are put together well and the metallic accents around the AC vents, steering wheel and centre console have upped the premium quality of the cabin. The EcoScore function let’s you have fun with the fuel efficiency when driving and the small info display can be operated through the elegant set of buttons on the steering wheel. They’re easy to read even when too much sunlight enters the cabin. The six-way adjustable powered driver seat and manually adjusted reach and rake steering setup are convenience factors executed to perfection. The foldable tables erected from the front seat backs could’ve been a bit more spacious, at least to place a notebook comfortably on it. The left-side seated passenger can adjust the co-driver’s seat manually as well and there’s feel-good wooden trimming on the doorpads and the seatbacks. 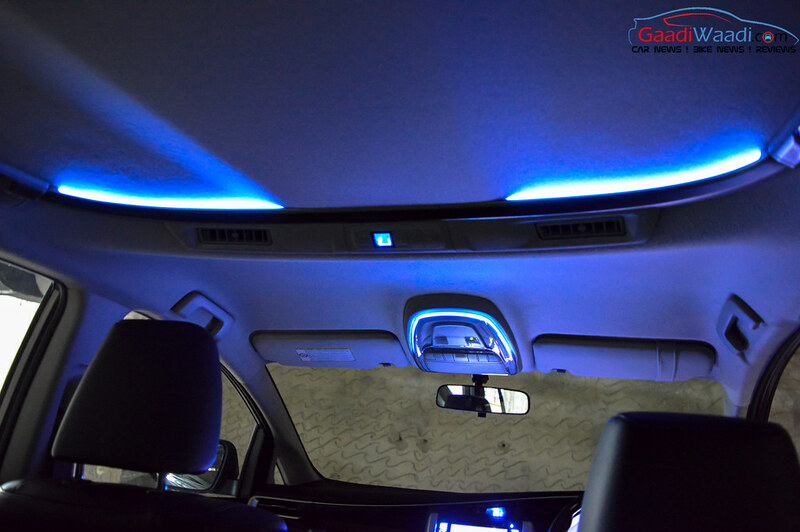 There’s an exclusive climate control system for the rear and the blue mood lighting elevates the entire appeal to a new high. The very practical cabin can hold 20 bottles. Toyota put a lot of thought into this and the engineers from Japan came all the way down to India to assess on that matter as Indian use more one litre bottles rather than larger capacity drinkers found in other countries. 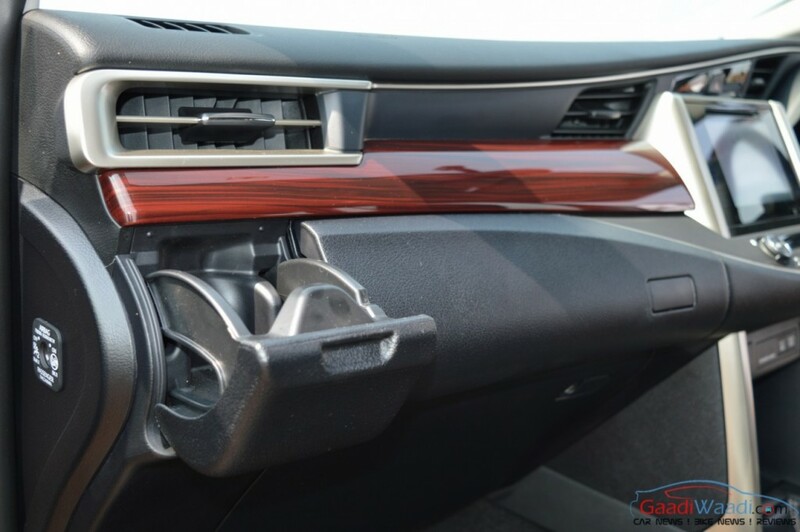 Along came the innovative foldable bottle holders on each side close to the AC vents up front came as a result of that and up to three bottles can be stored in the each of the front and rear doors. There are two glove boxes, one is cooled and the other is normal and can accommodate decent storage. The bottle-holder provisions are given to the third row passengers likewise. The new Innova comes with more bootspace and extending it will be easy as the third-row seats flip up and away with just a pull. As ever, the trademark cabin fit and finish is highly recognisable but it lacks soft material touches as seen in the executive-class sedans while the plastic bits up front could have been given a nicer treatment. The most annoying accessible facility is the one USB port for the entire car. In a nutshell, the interiors have a highly pliable seating arrangement, loads of boot and cabin spaces, practical and luxurious dashboard elements, controls and knobs alongside the signature comfort that could be said as “doubled up”. The lower variants of the Toyota Innova Crysta will have an easily accessible and functional seven-inch entertainment system with voice commands and Bluetooth connectivity, attractive dual-tone interior with silver accent alongside security systems like door ajar warning and anti-theft system. The safety technologies offered are dual front airbags and driver knee airbag, ABS (Anti-lock Braking System) with EBD (Electronic Brake-force Distribution) besides rear parking sensors. 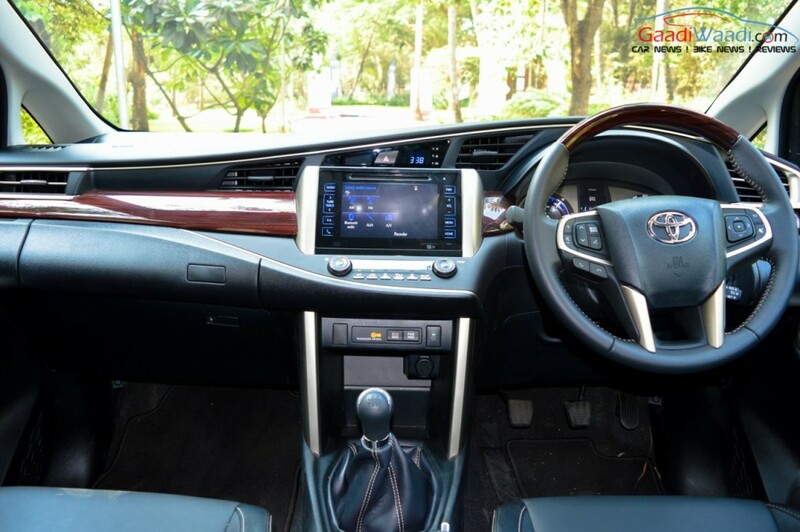 In the top-end variant, you will have the opportunity to make use of an eight-inch large infotainment system, blue ambient LED lighting, a TFT screen for the MID, automatic climate control, premium wooden finish, smart entry with push button start, VSC (vehicle stability control) and HAC (hill-start assist control). The 17-inch alloy wheels and LED projector headlamps provide imposing road presence while the safety is enhanced with seven SRS airbags. The new Innova features very supportive and considerably larger seats. You could feel the instant back and thigh support as soon as you roost on them and the wider cabin space at front will appeal to customers in aplenty. 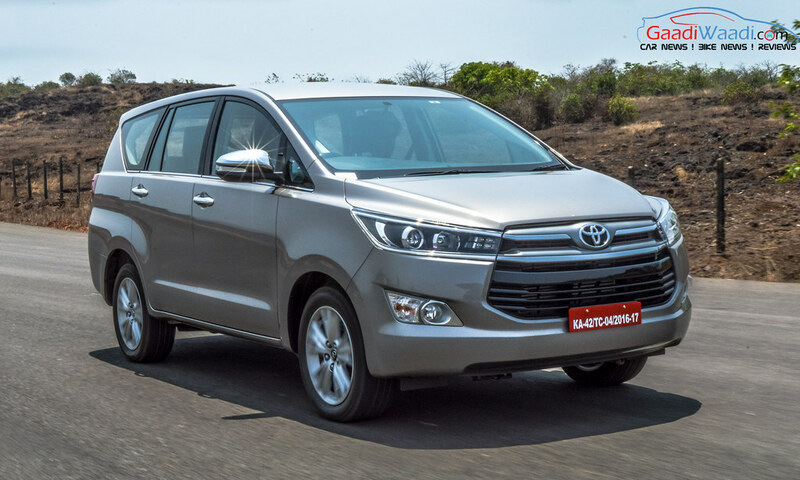 Toyota considers majority of the Innova owners do prefer to be driven and therefore appeasing them with a comfortable second row of seats is just as important as anything else. As like the front co-passenger and driver seats, the individual two seat-configuration in the middle is wide and supportive. 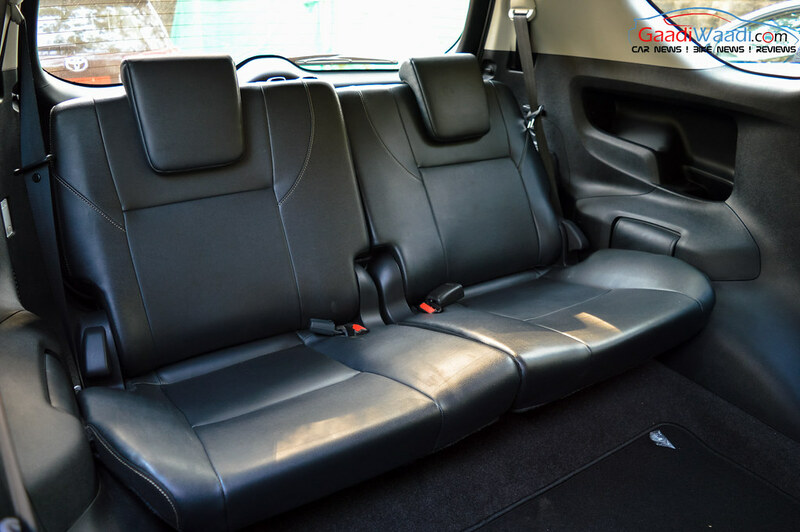 The increased length of the car comes into play as the occupants will get buoyed by the ample amount of legroom and knee room due to the well-trimmed seats. The headrests are not very hard and wouldn’t induce a headache on longer drives and are fairly sized. Although the seats are appreciably well-cushioned, the rear AC vents could’ve been a bit closer to the occupants for immediate cooling. Thanks to the flipping and tumbling one-touch feature of the middle seats, Toyota addressed a major issue as ladies will find it easier to get at the back in the new Innova. The extra bit of legroom offers comfort factor during long-mile travel for third row passengers too. However, the visibility of the third row is hindered quite a bit due to the subtle window line. The final row does offer adequate leg, head and knee rooms over the original Innova and apparently that will surprise a few. Having said that, the light entering that space should’ve been improved but nonetheless the well-engineered third-row will give the Mahindra Xylo a dedicated pondering. 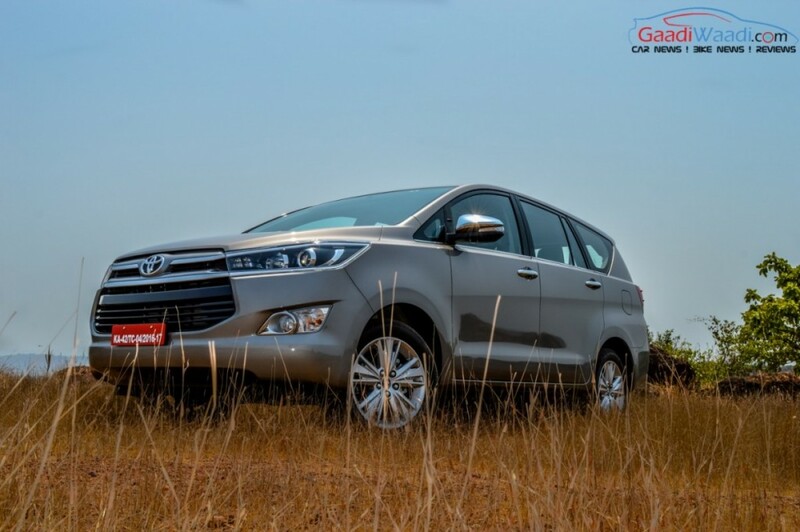 The performance of the current Innova is not a key area of brilliance despite having a striking driveability. The low-gear ratios did take the toll on higher speeds as you get vibrations and noise at over 100 kmph but those have been resolved with the new family of GD engines assembled locally at the company’s base in Karnataka. Toyota is offering the new Innova Crysta with a 2.4-litre 2GD-FTV BSIV compliant diesel motor with variable nozzle turbocharger, low friction timing chains and intercooler. The four-cylinder, inline, DOHC, 16V, common rail engine tuned for high swirl efficiency produces a maximum power of 150 PS at 3,400 rpm and 343 Nm of peak torque between 1,400 and 2,800 rpm. It comes mated with a five-speed manual transmission only and has Eco and Power drive modes. Toyota indeed has come up with a good solution and responded to the customers’ needs. The 2.8-litre 1GD-FTV DOHC 16V diesel engine is the most powerful ever to be offered for India and it churns out a massive 174 PS at 3,400 rpm and a peak torque of 360 Nm delivered between 1,200 and 3,400 rpm. The special bit is the introduction of a six-speed automatic transmission with sequential shifts. A step ahead of the outgoing engine, the new diesel unit is far more composed and the gear ratios are widened to provide better top-speed grunt. At the low and middle range, the performance is appreciative on Eco mode but switching on to the Power mode, the car is a completely new animal as the throttle become more responsible, clutch gets lighter and the suspension firms up. As its predecessor, the Crysta gets planted on the road and the Power mode offers huge leaps in acceleration. The soft and smooth Eco mode would benefit fleet operators in gaining better frugality as the fuel efficiency is rated at 15.1 kmpl (two kmpl improvement). If you want to be less aggressive and commute daily, Normal mode is of perfect fit. The power climbs up in linear fashion from 1,300-1,500 rpm onwards and by 3,500 rpm the full-amount of torque kicks in and thus 0-100 kmph can be achieved in just close to 13 seconds. It is more than a second slower than the Renault Lodgy MPV but you wouldn’t notice that sprint in a car that’s so comfortable and relaxed to drive. There is a bit of lag from the variable nozzle turbo in the low rpm band, nevertheless. In Eco mode, the clutch is heavy and so as the steering wheel response. Consequently, on highways you wouldn’t feel the car when swerving through the traffic – a big downside compared to the outgoing model. The gearbox is heavy and clunky as well and you would have to really work to get the best out of it. However, the refinement in the higher revs will overshadow some of these arguments and the car gets vocal once you reach 4,000 rpm. If you don’t bother doing manual shifting, the six-speed automatic will satisfy your senses. It can go nearly a second faster time than the manual version from nothing to 100 kmph as it’s powerful and engaging. Despite weighing 1,870 kg, it will mock some of the established executive sedans with its spurred up and exciting performance. Turn the traction control off, you can smoke the tyres but the biggest niggle we found with the drive is that the auto ‘box is too curious to both upshift and downshift. The tiptronic function for manual shifts works quite well, but the gearbox is not as seamless. Plainly speaking, you would love to saddle on this clutch less transmission vehicle and get served as it is few notches above its manual counterpart despite the minor issues. The Innova Crysta is built on a new body-on-frame structure and is based on the IMV (International Multipurpose Vehicle) platform with inputs from the Toyota New Global Architecture (TNGA). Resultantly, it shares some components with the HiLux pickup truck and the soon-to-arrive Fortuner. 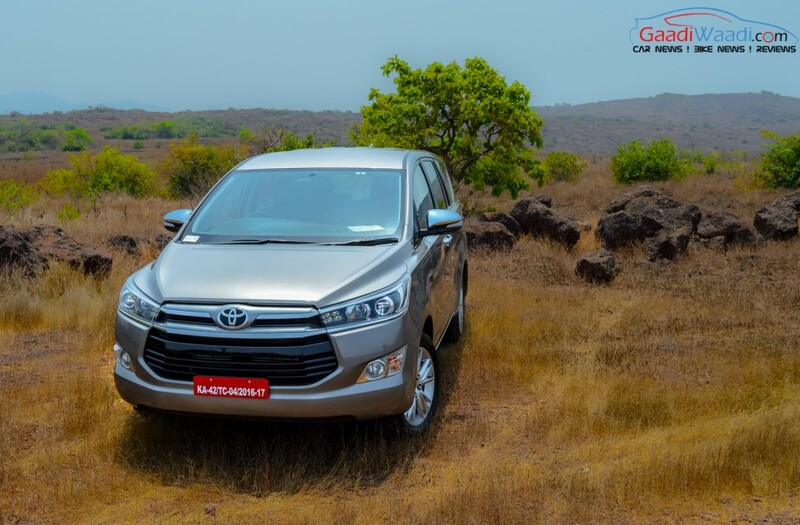 The outgoing Innova’s instant success was down to the riding quality rather than handling and the Crysta wouldn’t disappoint in that respect too. The suspension duties are dealt by a double wishbone with torsion bar setup front and four-link with coil spring at the rear. As for the brakes, there’s a 16-inch disc and leading-trailing drum unit at front and rear respectively. The new Innova does have a good cornering ability as it’s planted on the road but pushing ‘harder’ meant the excess weight comes into effect and lets the body-roll spoil the fun. With that said, the chassis is stiffer with the use of strengthening aluminium materials but at lower and speeds of up to 120 kmph, the car just comes alive on its own. Kudos to Toyota for not spoiling the hallmark ride quality, as the larger diameter dampers and chassis stiffness combine to deliver a smooth and absorbent ride. The suspension travel is quite long and the firmness on big bumps can be attributed to the low profile 215/55 R17 rubber. However, the grown-up ride setup with the ground clearance of 167 mm has acted efficiently to put you on an enjoyable long-distance travel without even being slightly tired. 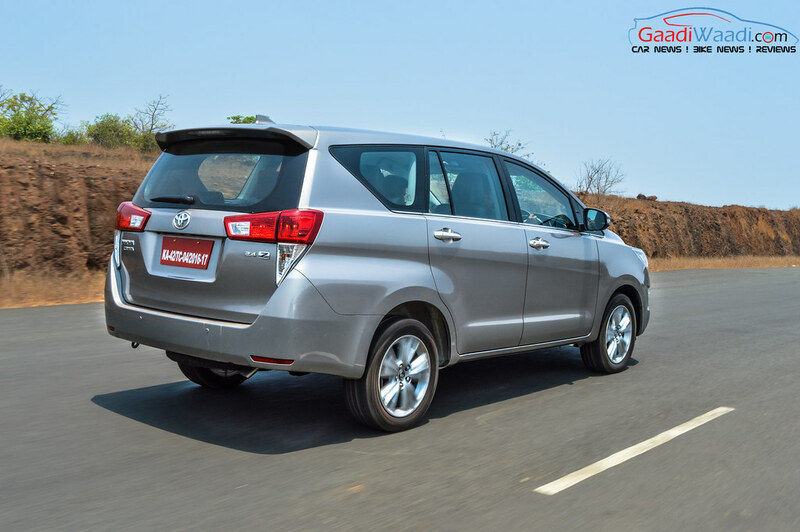 The Innova Crysta will set the bars up higher for Toyota and reassure its dominance in the MPV segment. The brand’s signature dependability, practicality and the feel-good factor are here for a long stay likewise. At the end of the day, you would come to realise that Toyota knew what it was doing and had stick by it with perfection. Despite Toyota asking Rs. 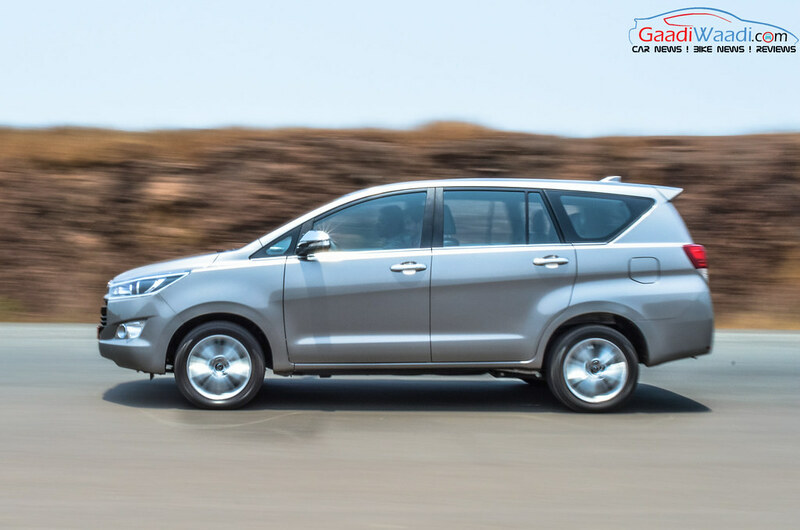 20.78 lakh for the top-of-the-line ZX 2.8 AT variant, the Innova Crysta will set the guns blazing in sales as the customers seeking the MPV traditionally would prefer a product of high quality and shrug off the price range largely. The other automatic variant, GX AT 2.8, carries an ex-showroom price tag of Rs. 16.18 lakh and the manual grades begin from Rs. 13.83 lakh and end at Rs. 19.62 lakh. 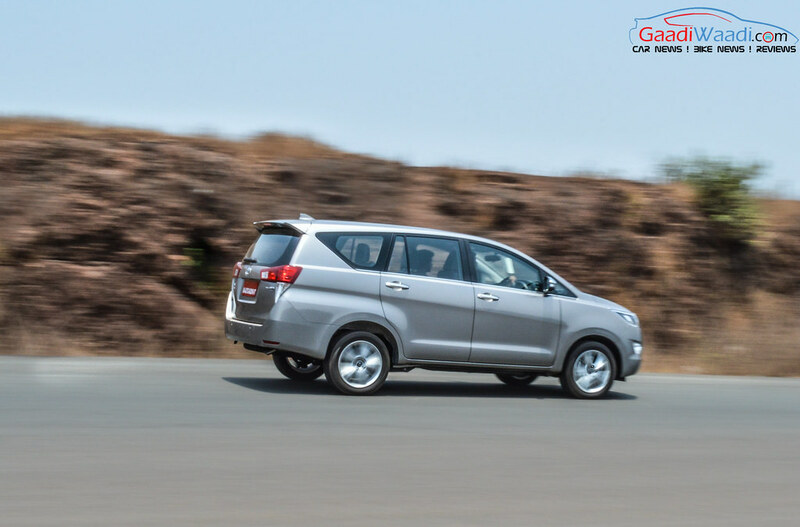 The Toyota Innova Crysta boasts in a segment of its own and it will play to the MPV’s strengths. The overall package of the people carrier has certainly belonged to the liking of the prospective buyers and the Japanese brand has every trick in the box to convince the customers why the new model has been priced significantly higher than its predecessor. The exterior is hugely rewarding as the design elements would refuse to fade away for quite some time through its life cycle. The well-thought-out and executed interiors would give an auspicious first impression and the mechanicals, despite some minor frets, would be overshadowed by the MPV’s tireless passenger carrying ability on long distance travel. You can’t ask more in terms of the cabin and boot spaces and the comfortable third row seat arrangement pulled off the surprise for all the goods. 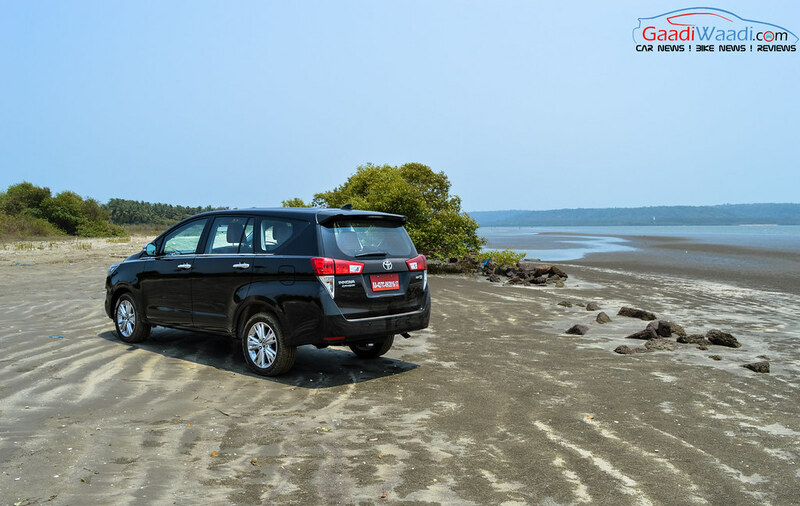 A special mention should go for the seating comfort from front to back and as Toyota wants, the customers will play an active role in being the endorsers for the brand as the legacy of the Innova is here to stay for several more years.